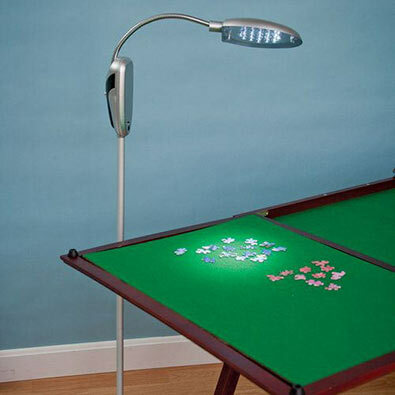 Our convenient cordless lamp has 16 bright LEDs for ultra-clear vision of colours and details. Easy to place anywhere and fully adjustable gooseneck allows for maximum versatility for puzzling or any craft project. Requires six AA batteries, not included. Extends to 127cm tall, 21cm diameter base. Open this decorative tin and everything you need is there to keep your glasses in tip-top shape. Metal multi-tool with carabiner includes tiny Phillips head and flat head screw drivers to tighten your loose arms. Glass cleaner and fine cleaning cloth will keep your vision sharp. Tin measures 12cm x 6cm x 3cm. Rock to your own beat while wearing these earmuff speakers! Made of purple knit acrylic with snowflake pattern on the ears and lined with synthetic fur for extra warmth. 117cm cord fits into most phone and mp3 music jacks. One size fits most.